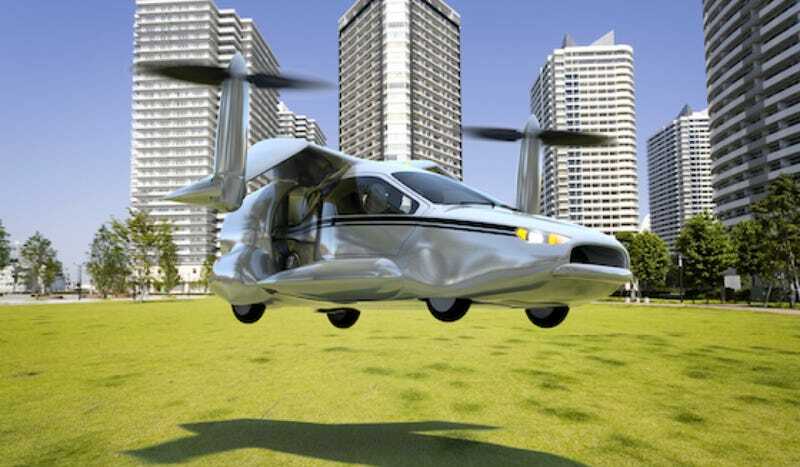 Terrafugia made big waves last year with the introduction of the Transition, the first flying car. Sure, it was more of a driving plane than a flying car, but it brought a dream everyone has had to life. They're already planning a successor to the first model, and it'll go 200 MPH, take off vertically, and do other crazy things. The new car, which Terrafugia says will go on sale after the Transition, which we saw last year, is called the TF-X. Imagine that someone took the front end off a Ford Fusion and then stuck it to a Bell-Boeing V-22 Osprey, that veritable military propeller plane that can also take off vertically. Once airborne, it'll supposedly fly at 200 MPH, which is quite fast. The TF-X will also be a plug-in hybrid, according to Terrafugia. Electric motors will work to help it take off vertically, and then gas will engage to propel it forward in flight. A pilot's license wouldn't be necessary since there would be a number of autopilot functions to keep everything in check. Of course, if those computers failed, that would be very, very bad. Right now the car is in its very, very nascent stages of development and design, but Terrafugia believes the car is 100 percent feasible and will be able to be built. That's always a good starting point for when you're trying to build something new. Look for the TF-X to go on-sale after the Transition, which is supposed to start deliveries in 2015 or 2016, maybe probably sort of... if it ever gets built.